I have long been interested in a quest for low sugar healthier jams. A neighbour even dug out a WW2 recipe book for jam making during sugar rationing! I have had some successes but am still disappointed by how much sugar is often needed for jams to set, with some runny disasters too. 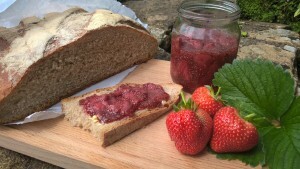 This year has been a bumper one for strawberries in my garden and jam is a great way to save some for Autumn/ Winter. One of these recipes is healthier than the other, with only only 100ml of maple syrup, but both allow the flavours of fruit to come through rather than sugary sweetness. I prefer to use maple syrup as a sugar substitute in healthier recipies, as Ayurveda is not keen on heating honey. 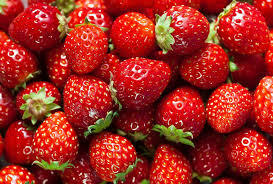 Gently heat 500g strawberries with 100ml maple syrup in a pan until the strawberries release their juices. Add two tablespoons of chia seeds and heat for a couple of minutes. Remove from the hob and allow to sit for 10 minutes, by which time it will be thick. Transfer to a jar and keep in your fridge. For variation, you can add rose water, vanilla or even rose petals to this jam. Why not try making a blackberry version in Autumn (sieve pulp first to avoid the pips!). The thing I am most happy about is that my children like this jam and have previously run a mile from anything with chia seeds in it. I think they are disguised as they look just like strawberry seeds. Delicious with spelt sourdough bread, pancakes or home-made coconut yoghurt. Enjoy! 6 unsprayed red roses (or a handful of edible dried rose petals); 1kg of strawberries (hulled and quartered), 1 kg rhubarb (trimmed and cut into 2 cm lengths), 300g golden caster sugar, 1 unwaxed lemon quartered; juice of 2 lemons and 4 tablespoons of rosewater. 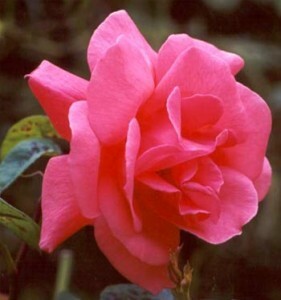 Gently pull of rose petals and rinse. Put a saucer in the freezer for checking jam later. Put strawberries, rhubarb, sugar, quartered lemon and lemon juice into a large pan, place over allow heat and allow sugar to dissolve slowly. Once it has, increase heat to bring to a boil and simmer for 30 minutes. After 45 minutes, check jam by sponging onto the saucer from the freezer. If it wrinkles when you push it with your finger, its ready. Otherwise, cook for a few minuets more then test again. Once you are happy with the set of your jam, turn off the heat and stir in the rose petals and rosewater. Allow to cool a little then spoon into sterilised jars. Screw lids on and allow to cool. Store in a cool place until you are in need of some jarred sunshine. Anna Jones writes “By regular jam making standards, I only use a tiny bit of sugar here, so the texture is looser than a heaver-set jam.” I can vouch this jam is so delicious you will never make jam with 1kg of sugar for every 1kg of fruit again! For general tips to stay cool and calm this Summer, for when it finally arrives click here.